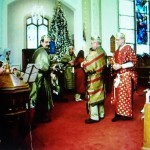 Three Wise Men, Christmas program, c2008. The children’s Christmas program is an annual event at our church. It is a time of pride for parents and grandparents as they get to see their little ones dressed in special Christmas clothes, nervously saying their “pieces” and singing in front of the congregation. When I was a child our Christmas pageants were usually held on Sunday morning or Sunday evening. We had a rehearsal on the Saturday before the performance. There was a big party in the church basement after the rehearsal and we had food and a gift exchange. It was a lot of fun. 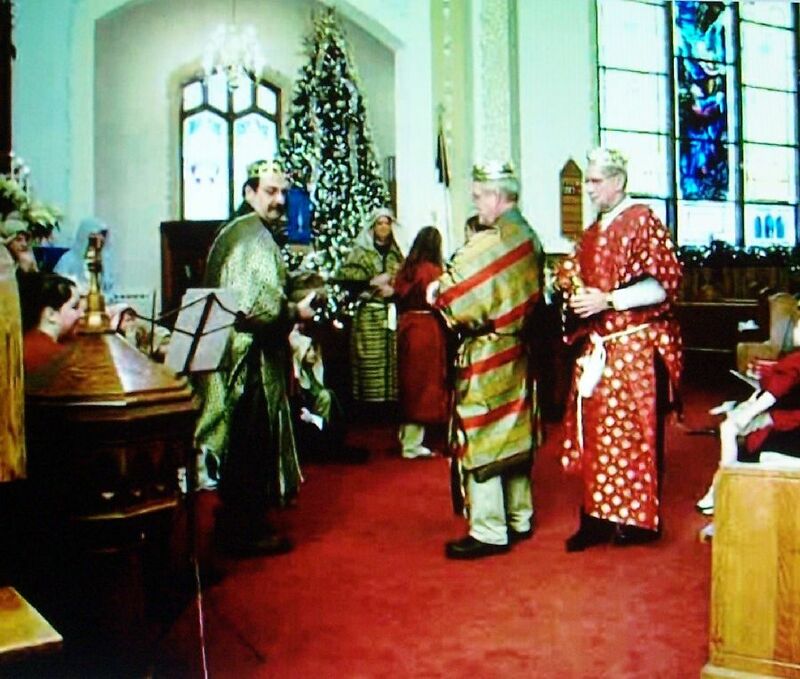 The first Christmas program that I remember participating in was held in our church basement. It may not have been the Christmas program, but it was an event of some sort held during the Advent season. I was about five years old and I sang the 1950s hit, All I Want for Christmas Is My Two Front Teeth. 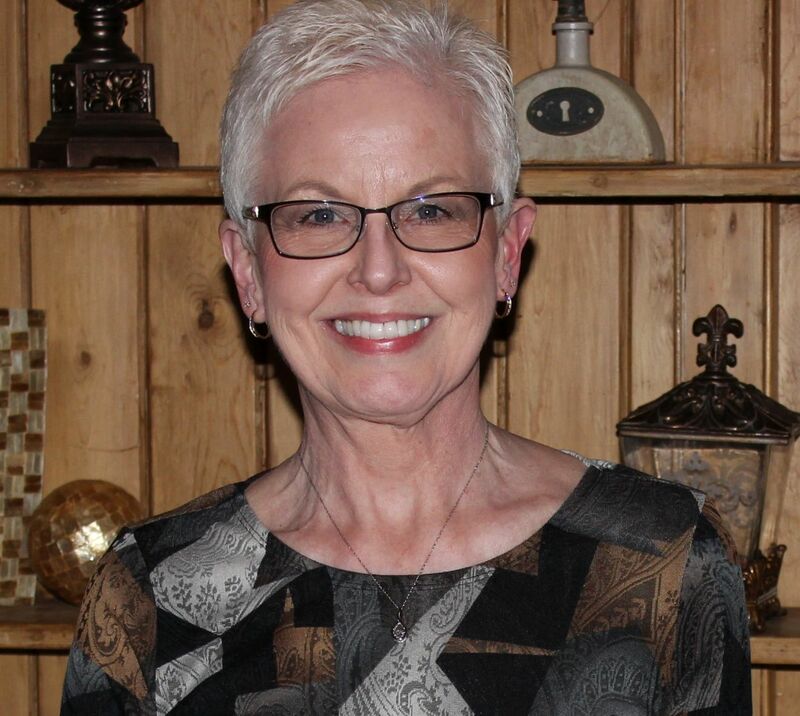 I was scared to death to sing in front of people and would never have gotten through that song had it not been for the beautiful pink and blue Teddy bear that our neighbor Cindy had set on top of the upright piano. I focused on that bear and I somehow knew that he would be mine if I could finish the song. I did finish the song and I did get the bear. “Smiley” was my cuddly companion for many years after that. Memorizing and reciting a Christmas piece has always been a part of our Christmas programs. I was never good at memorizing and worried about saying my verse correctly. I don’t think most children are good at memorizing their pieces. The little ones get a lot of prompting from the Sunday School teachers and the older kids usually just read their parts. 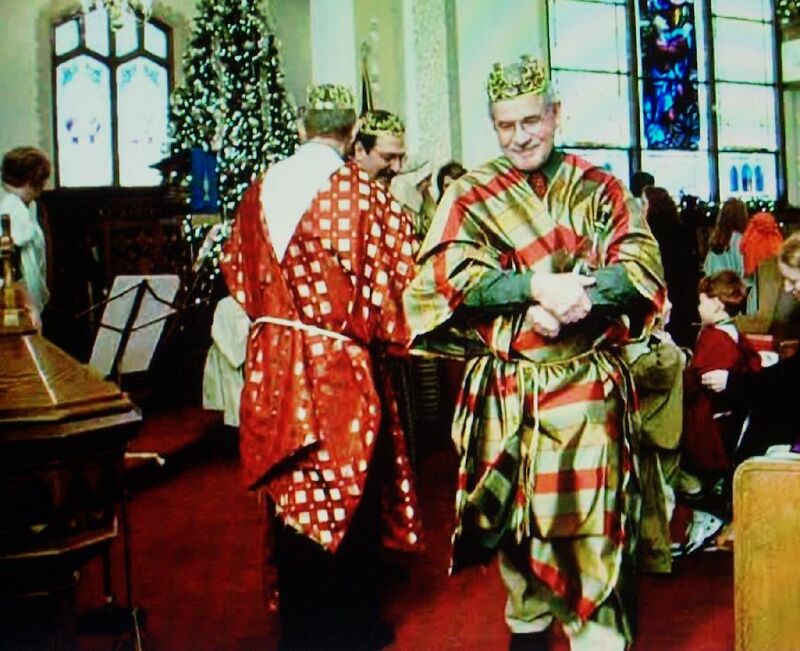 Joe as a Wise Man, Christmas Pageant, c2008. I guess I have always been a Nervous Nellie. When I was young I was anxious about my part in the Christmas program and later I was nervous about our son’s part in the program. He was a spirited, independent and strong-willed little boy and we never knew what he would do in front of a crowd. It did not matter that the crowd was our church family. He had no shame as he rolled around on the floor or ran around the manger. We held our breath until the program was over. Why are the antics of little ones always more amusing when they are not your own children? When all the characters of the Nativity are all in place the rest of the children usually sing Away In a Manger and Silent Night. The program concludes and the costumes are put away for another year. I remember also putting on a play on New Years. This was around the mid to late 1940’s. I have heard people talk about the New Year’s program. It is hard to believe that I do not have any photos of past Christmas programs. I only had the photos of Joe as a Wise Man, and they were from a video I took. Does the Pope’s proclamation that the nativity is myth change anything about the Christmas tradition? Not for me! The Nativity scene will always be a part of Christmas for me. Indeed. Not certain how anyone could imagine that the nativity story or program was literal, as it clearly is aimed at bringing together so many diverse events into a simple and direct presentation to capture components of many verses, ideas and separate events in the Bible message. What is puzzling is the Pope’s need to make a formal decree that it is myth. Jeff could definitely be a show stopper but in a good way. I wonder if our grandchildren will have the uncommon stage presence I exhibit in these pictures of one of my more memorable performances. 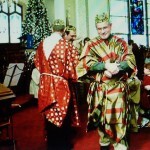 I considered myself lucky not to be typecast as a “wiseman” after this play.